Born in Lima, Peru in 1978 Vanessa Colareta lives and works in Madrid. In 2013 she was named Still Life Professional Photographer of the Year at the Sony World Photography Awards, London. Vanessa has participated in exhibitions and events related to the visual arts such as “Art Lima 2014” at The Army School of Lima (Peru), “Sony World Photography Awards 2013” as part of the Month of Art, at House of Culture in Bratislava, “Lima Photo 2013” at the Image Centre in Lima (Peru), “Sony World Photography Awards 2013” at Somerset House in London and “Cafe Dossier” at La Tabacalera in Madrid, among others. Her artistic educations started with B.A. in Fine Arts in Polytechnic University of Valencia, Spain and continued with M.A. Visual Arts and Multimedia, Photography in the same university. Among Vanessa Colareta’s awards could be marked out the following: “Sony World Photography Awards” Still Life Photographer of the Year, London, UK, “Repsol Lima Photo” Lima, Peru, “Fine Arts and Photography Awards of the Honorable Provincial Council of Alicante” Alicante, Spain, all in 2013. The works shown at the exhibition “Still life: story behind” at Nunc Contemporary gallery are selected from “Migrant” and “Exodus” series. 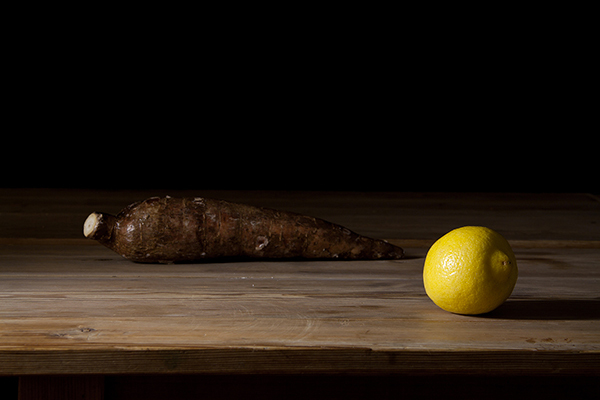 Vanessa Colareta - Still Life with Yucca and Lemon, 100 x 120 cm, 2011. Inkjet print. Ed. : 5 + 2 A.P. Image © Vanessa Colareta. Used here by kind permission from the artist and Nunc Contemporary. All rights reserved. “The idea of Migrant arises from the convergence of several factors linked to personal experience as an immigrant and as a woman, by the societies I’ve met and the culture in which I grew up.” This change has been a trigger and an inspiration that immediately generated a wish to share. Vanessa stresses the women’s role: “I decided to focus on women because they have a particular problem of being women and being immigrants. Women often have poorer working conditions and have lower salaries than men. Being immigrants makes them even more vulnerable.” The artist uses an unusual photography genre to denounce this issue – still life. “The still life photography has got a symbolic potential because its component objects. These objects reflect our relationship with the world and through them it is possible to outline a certain lifestyle or a society.” Further this theme is unfolded in Exodus series. Depicting commonplace objects and using them to bring a message to the viewer, of social and political importance especially, is quite a unique approach in our days. Colareta’s still life works reflect the instability and concern, home sickness and uncertainty towards future, they are very gentle and personal. Their resemblance to the paintings of the Spanish Golden Age only makes these works more tactual and faultless. 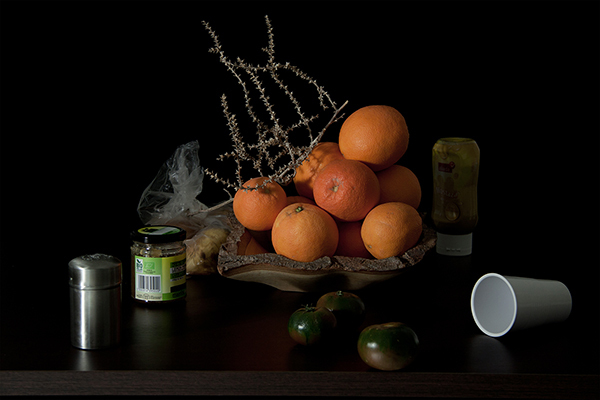 Vanessa Colareta - Oranges, Tomatoes, and Jam, 100 x 120 cm, 2013. Inkjet print. Ed. : 5 + 2 A.P. Image © Vanessa Colareta. Used here by kind permission from the artist and Nunc Contemporary. All rights reserved.